The man held up a bank inside the Galleria and earned his nickname after being seen leaving the parking garage on a motorcycle, according to the FBI. 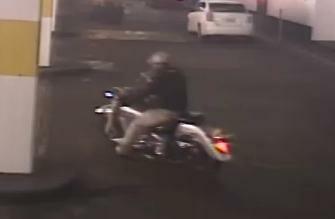 Video surveillance photos show the armed robber leaving the garage on a silver Yamaha Road Star motorcycle. The “Biker Bandit” is described as a Hispanic male, standing 5’10” and weighing 160 pounds. He was wearing a black leather motorcycle jacket and a black baseball cap with an unknown logo. Anyone with information is asked to call Crime Stoppers at 713-222-TIPS (8477) or the Houston Field Office of the FBI at 713-693-5000.